Chloe X Halle is a pair of R&B sisters hailing from Atlanta that is made up of Chloe (19) & Halle (18) Bailey. The duo have been making music since 2013, releasing a steady stream of covers on YouTube along with some original material. They’ve gained quite a following and have been getting bigger and bigger opportunities over the past few years. They served as the opening act for Beyonce on her Formation World Tour, and performed at the White House as guests of First Lady Michelle Obama. The duo have also been cast on the Freeform show Grown-ish, playing a pair of track star twins attending Cal U. Their song “Fall” is the second single off their EP Sugar Symphony, and was released in September of 2016. 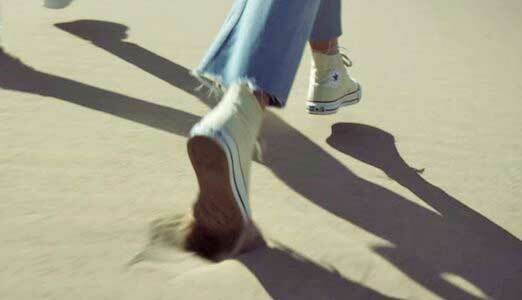 Halle wears a pair of natural white high top chucks in this music video. This is a song of hope and optimism. The duo ask, “So what if the rain falls? Just go find the gold at the end of the rainbow,” which is a wonderful outlook on life. The music is a light piano accompaniment that puts a heavy focus on the vocals from Chloe and Halle, which really is the right choice because they kill it. Their vocals are almost operatic and they lift this song to new heights. The tender nature of the vocals offers up a angelic and enlightening tone that makes the listener believe that there is gold at the end of the rainbow. Go ahead and let the rain fall, there’s always more desert around you. 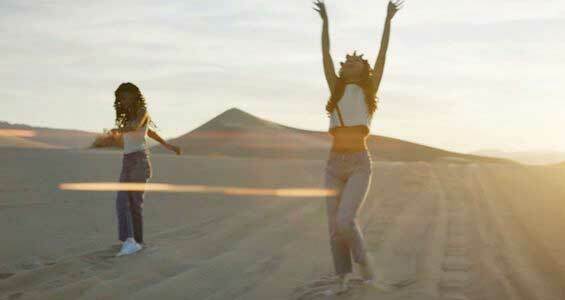 The music video is set in the desert, where Chloe and Halle run across the sand and scale mountainous sand dunes. The girls are dressed in near identical outfits: cream shirts with blue jeans. However, the key difference is that Halle is wearing a pair of cream colored chucks that not only match her top, but also match the fine sand that they’re running across. 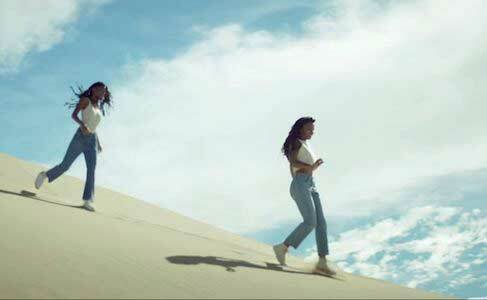 The duo spend most of the video traversing the desert, which offers up some gorgeous shot of the scenery. This barren desert where there couldn’t be less rain presents an interesting difference between the visuals and music. It can be looked at this way: even if it rains in a desert, it’s still a desert, meaning that no matter how much negative there may be falling on you right now, there’s still positive stuff all around you. Use the links below to get yourself a new pair of chucks for your desert run.